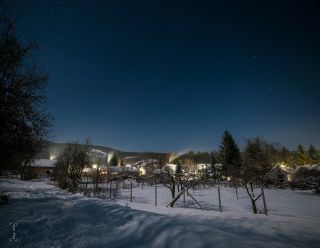 Amateur astrophotographer Béla Papp took this picturesque moonlit scene near the village of Óbánya in southwest Hungary. This picturesque moonlit scene was taken next to a small village in the Mecsek moountains in Hungary. Amateur astrophotographer Béla Papp took the image near the village of Óbánya in southwest Hungary. "It was all calm and quiet. I wanted to capture this peace in the pictures. It was minus 14 Celsius (6 degrees F) but I did not feel cold because of the excitement inside," Papp wrote in an email to Space.com.